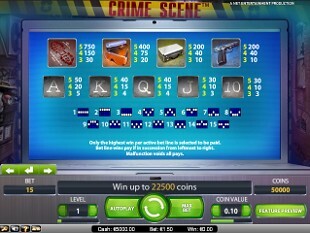 Crime Scene Slots is a crazy 5 reel and 15 payline game. The game is powered by the popular NetEnt, so you will get incredible graphics, stunning gameplay, bonus games and extremely high payouts – all in one slot machine. From the features we’ve just listed you should pay special attention to the amazing Bonus Game allowing to raise a lot of cash for only a couple of clicks! As we have already stated, the fresh slot is powered by the reliable NetEnt platform, and you know, what it means. Yes, indeed! The game works in no download mode! So, you need only a couple of clicks to start a rewarding investigation on the reels. Crime Scene Slots tell us a mystic story of a recently committed crime. The main hero of the story is a detective. You are suggested to try your conspiracy skills and help him with the investigation. And you really have to try your luck, as helping the detective well and making some lucky matches will give extremely high rewards including the top jackpot of 7,500 coins or $7,500! The graphics of the game are smooth and well-featured. The patterns were selected incredibly well, and create a pleasant atmosphere. All-in-all, you can both relax and get thrilled while playing the Crime Scene Slots, as NetEnt geeks worked really well on game mood and gameplay. The featured sounds are also nice and help you enjoy the game even more. To get some cash you’ll have to make crazy matches. It’s not hard at all – you just have to make bets and try catching a couple of combinations with the following featured symbols: Pistol, Bloody Step, Case, Glasses, Badge and Fingerprints. Apart from these beautiful and rewarding icons you can also match some classic ones: Ten, Jack, Queen, King or Ace. The standard choice of coins you can choose for betting in Crime Scene includes the following options: $0.01, $0.02, $0.05, $0.10, $0.20, $0.50 and $1. Besides, you can change the sum staked by varying the bet level from 1 to 10. This means each payline will get 1 to 10 coins, which gives you a lot of possible bet sizes. The number of paylines cannot be changed in this slot machine. But don’t get disappointed – the bets in Crime Scene vary between $0.15 and $150, so you’ll have a lot of opportunities to try different betting strategies. For instance, if you like risking and tickling your nerves, just make sure that the bet indicator shows the maximum of $150. However, if you’re a careful person, choose the minimum of $0.15. The highest Crime Scene jackpot is 7,500 coins or $7,500 for 5 Blood Step symbols. The second Crime Scene jackpot is 4,000 coins or $4,000 for 5 Glasses symbols. The third Crime Scene jackpot is 2,000 coins or $2,500 for 5 Case or Pistolsymbols. The wild symbol of this game is the beautiful Badge. This badge gives you a unique opportunity to make a lucky match even if some symbol is missing in a combination. The wild Badge works with any icon except the bonus Fingertips. In Crime Scene Slots the Badge has a very interesting and incredibly intriguing feature – it’s a Sticky Wild! This means every time this icon appears on the reels it will remain on its place for up to 5 spins! And during all this time you’ll be getting a lot of extra lines matched with the help of the wild! Ah, yes! And don’t forget that every lucky win containing a wild is tripled! In this game the functions of scatter symbol are performed by the bonus icon of Fingertips. It can appear on any reel, and when you match at least three of them in different positions, you’ll get awarded a nice Crime Scene Bonus Game! Bonus Game. 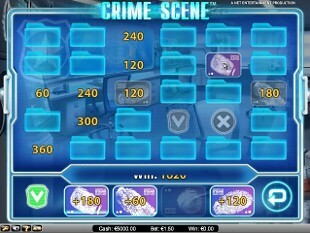 In Crime Scene Slots the special feature is activated by a lucky match of 3+ bonus icons. When you get the lucky match, you’ll be redirected to a separate screen with a lot of cases. Every case contains a certain sum of cash proportional to the size of you current bet. All-in-all, you can get an incredibly huge sum. The game has a special button – Feature Preview for you to see how it works in details. 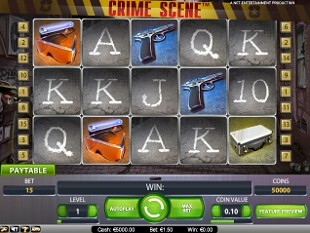 Crime Scene slot machine is one of the hottest NetEnt games released this year. It combines a lot of intriguing features, great graphics and nice payouts. 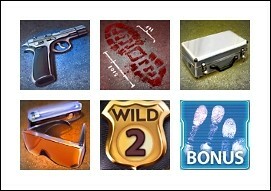 If you like special games, at Crime Scene you can win a lot with the featured bonus or try catching several sticky wilds. Actually, words aren’t enough to describe the game, so you just have to try it and make sure that it’s worth playing!